When you first start to think Finnishness a lot comes to mind like Finnish forests, lakes, sommercottages, four seasons especially winter, wintersports, means to us etc. I could go on and on about those, but here are already great posts about those subjects. 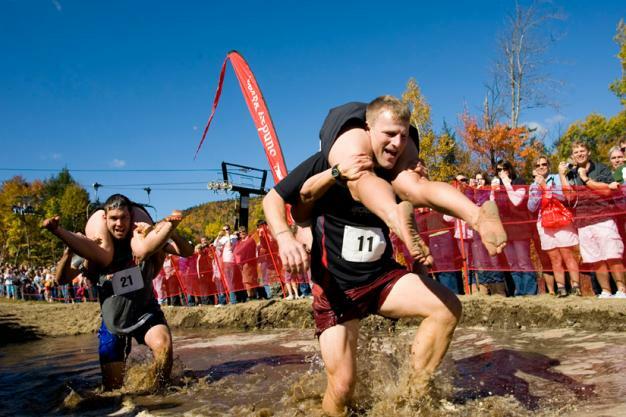 Eukonkanto is a sport, where man needs to race through obstacles while carrying his partner upside down. The winner wins his partner weight in beer. For this entertaining sport worldchampionship contest is held every year in Sonkajärvi since 1992. There the track includes one meter deep water jump and two fences you need to climb. Some say the idea came from Finnish skiers strength training did on a swam for this sport. But no matter where it came from Finns has had their own championship contest since 1998. Since that the contest has grown into the world championship, which is held in Hyrynsalmi. The rules have a big resemblence to football, but there are quite a few differences. The playing fiel is only 60 meters long and 35 meters wide, so it only makes sense that a goal is also smaller being only 2 meters deep and 5 meters wide. The game includes two rounds each lasts ten minutes. Each team has max. five + one player on the field same time.